Seven-in-ten households with a net worth of at least $25 million said that saving and investing their money gives them greater satisfaction than spending it, while more than half (54 percent) cite as their primary concern that the next generation will be wasteful with the money passed on to them. Not that they aren’t enjoying their wealth. Roughly half (49 percent) of $25 Million Plus households attribute their happiness in large part to the wealth they have accumulated, according to Millionaire Corner’s wealth level study. But there are, to a lesser extent, drawbacks, they report. 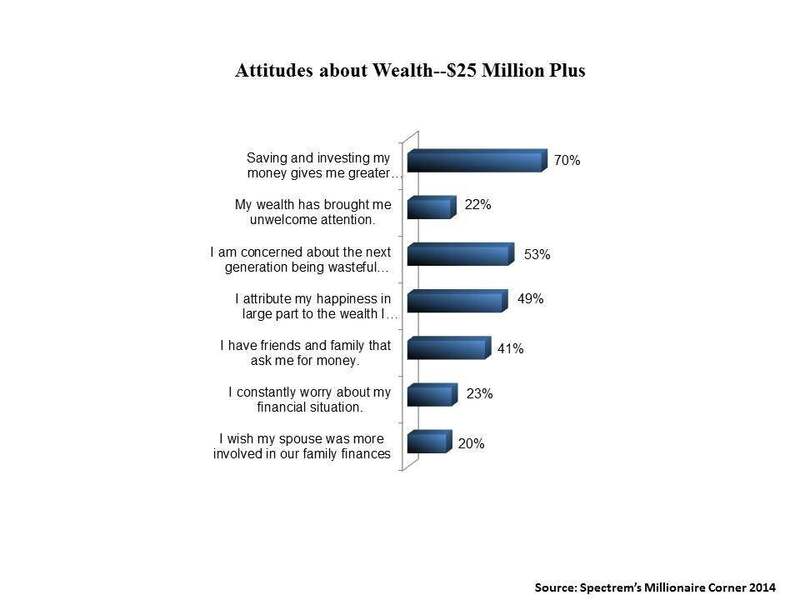 Almost one-fourth (23 percent) said that they constantly worry about their financial situation, while 22 percent said their wealth has brought them unwelcome attention. Some of that attention has come from family and friends. Four-in-ten ultra-wealthy respondents said that acquaintances ask them for money. The youngest $25 Million Plus investors surveyed are more sensitive to unwanted attention. Of those who cited this as a drawback to their wealth, the highest percentage (31 percent) were under 55, followed by 20 percent of Baby Boomers ages 56-65 and 14 percent of seniors. Younger $25 Million Plus investors were also more likely to self-report being constantly worried about their financial situation (31 percent) compared with 21 percent of Baby Boomers and 9 percent of seniors. Seniors, conversely, were more likely to consider their wealth in the most positive light. Six-in-ten said they attribute their happiness in large part to the wealth they accumulated, compared with 51 percent of those under 55 and 46 percent of Baby Boomers.